With application virtualization, as it is not dependent on client terminal-side resources, re-use and long-term use of legacy client terminals becomes possible. With application virtualization, by not saving data on the client terminal, information leakage countermeasures and limiting the scale of the impact of a client terminal becoming infected with a virus becomes possible. With application virtualization, client software deployment tasks that become necessary for the application improvements, etc., only need to be carried out on the server side, thus making it possible to reduce administrative costs. When there is an outbreak of a new strain of pandemic influenza, a work environment required for business continuity is provided remotely. In addition, when telecommuting or during business trips, etc., it is possible for each individual worker to seamlessly access their own work environment remotely, and we can achieve improved operational efficiency. 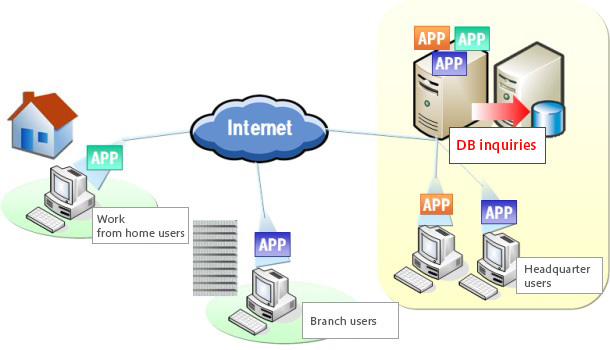 Compared to traditional client / server systems, it is possible to use applications on the client terminal with optimal operation even in narrow-band environments. We carry out requirement definition, design, hardware setup, software installation and configuration of required parameters for the application virtualization products offered by Citrix. * Company and product names are the trademarks or registered trademarks of their respective owners.